Remove oxidation with the Italian-made �Big Foot� polisher! The Rupes LHR 21ES Marine 31 Boat Oxidation Removal Kit enables you to remove oxidation, yellowing, and surface staining from your boat faster than any other system available. The massive 21 mm stroke of the Rupes LHR 21ES paired with Lake Country CCS pads and Marine 31 boat compounds and boat polishes is the perfect recipe for smooth, glossy gel coat. This all-inclusive Rupes Marine 31 kit includes everything you need to polish your boat from start to finish. The Rupes LHR 21ES Big Foot Random Orbital Polisher ensures a perfect finish with its random orbital motion and exceptionally large throw. One of the biggest advantages of the LHR 21ES is that no swirls or holograms (also referred to as buffer trails) are instilled into the gel coat as you polish. A conventional rotary/circular polisher, while very effective at polishing gel coat to remove oxidation leaves swirls and holograms in the finish as a result of its direct drive, circular motion. Simply put, the Rupes LHR 21ES Big Foot Random Orbital Polisher leaves you with a perfect finish that�s free of swirls and holograms � all without the risk of burning through the gel coat. 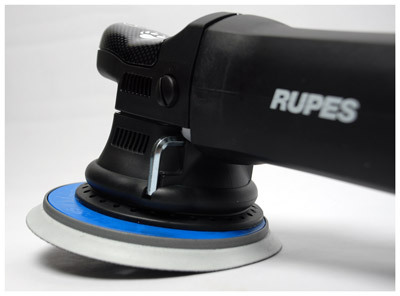 The Rupes LHR 21ES is so easy to use that even a novice can have the polisher mastered after only one panel! Foamed Wool 6.5 inch Buffing/Polishing Pads feature patented nanofoam particles that encapsulate the base of the wool fibers to help prevent caking and matting. These manufactured Foamed Wool pads polish like a wool pad but finish like a foam pad, giving your vehicle�s paint the best qualities of each. Use the Foamed Wool Pad with Marine 31 Gel Coat Heavy-Cut Oxidation Cleaner on light scratches and scuff marks. A total retail value of $599.88. You save $99.99!